For the love of long-takes. Each scene of this 50 minute stand alone-episode of the true crime serie Van God Los aka Godforsaken, is shot in one single take. Check out this one. With comedian-collueges Martin van Waardenberg and Henry van Loon in the role of father and son Beverman. Inspired on true events. Want to see the whole film? Mail for access. The film features the thirty-two-year-old waster and eternal student Thijs, who leads a slovenly, relaxed life full of beer, chicks and the occasional shift at a tedious media megastore. When Thijs visits his sister's house to do some washing, instead of his usual encounter with her semi-perfect family, he meets Lisa, the baby-sitter: a mature sixteen-year-old with exorbitant ambitions. Without intending to, Lisa has a profound effect on Thijs, unveiling a deeply ingrained dissatisfaction with his own passive behaviour. 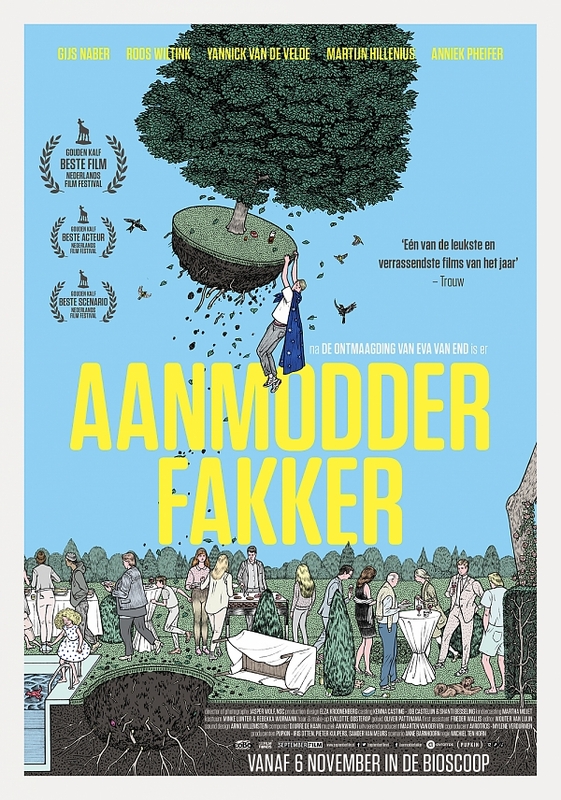 Aanmodderfakker had its world premiere during the Dutch Film Festival 2014. The film was nominated in six different categories: Best Music, Best Production-design, Best Actor, Best Screenplay, Best Director and Best Film. Eventually the film won three ‘Gouden Kalveren’ (the Dutch film awards) for Best Actor, Best Screenplay and Best Film. It made Aanmodderfakker the big winner of the festival. Want to see the film? Mail for access. 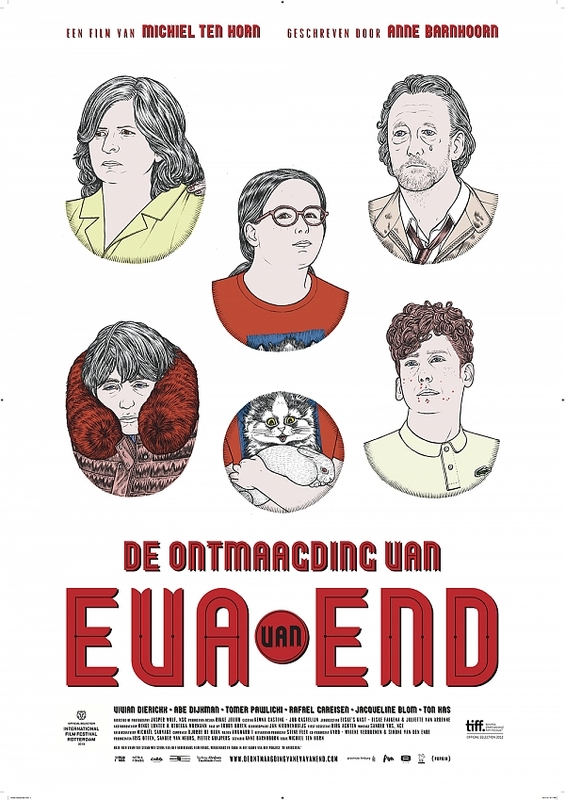 De ontmaagding van Eva van End is a tragicomedy about the Van End family who, after the arrival of an impossibly perfect German exchange student, can no longer imagine how they ever managed to live with their imperfect selves. The film had its world premiere at the prestigious Toronto International Film Festival in 2012. Ten Horn was chosen by Variety as one of 'Ten European directors to watch’, which set him and the film in the spotlight during the Karlovy Vary International Film Festival. The film has been well received abroad and has been sold to 23 countries. It released theatrically in the United States and had a VOD and DVD-release as well. Also take a look at the appealing teaser for The deflowering of Eva van End. The song 'My filthy entourage' is from musician Awkward i, who was responsible for the entire soundtrack of the film. When math teacher Bernd believes he sees a girl getting fingered by a boy in class, he gets totally confused about what happens sexually amongst the youth. Is there a world he didn’t know about for years? At the annual dance Bernd decides to dive in completely, without taking the possible consequences into account. Vingers (Fingers) was nominated for Best short film during the Dutch film festival in 2013. The film was selected for several international film festivals including Palm Springs International Film Festival. The aged Mr. Manders lives in a retirement home and sees his family rarely. The only creature he loves, is Arie, the canary. Then, the death of this bright yellow spot in his gray existence, creates new friendships and unexpected joy. Take a look at this lovely sequence. Want to see the whole film? Mail for access. When Tim’s dog runs out of the house one evening and doesn’t come back, Tim is at his wit’s end. The search for Keesie eventually leads Tim to the local Chinese restaurant. Tim enters a strange and creepy world where it proves difficult for him to distinguish between fantasy and reality. VPRO and Pupkin film produced this scary childeren's serie for which Michiel directed and developed one episode. Michiel also directed the wicked openings-sequence, in colleboration with stop-motion animator Niels Hoebers. It's a 'montage'! Want to see the whole film? Mail for access. Check out this sequence. Want to see the whole film? Mail for access. Another montage, towards the end of the film. When things are getting pretty hot. Want to see the whole film? Mail for access. Snappy, familiar and hard to forget. KesselsKramer and Michiel create a fiery film with a simple, memorable message for the Dutch government’s yearly house burglary prevention campaign. Production company Halal. Michiel directed a lil’ opera with bravado for Alfred International. Now sing along! 'Het beste van eigen bodem'. Together with KesselsKramer and Halal, Michiel made the 2016 NFF campaign film. Witnessing the birth of the Golden Calf, the most prestigious film price in Dutch cinema, alongside an ensemble of the crème de la crème of Dutch actors. The team was on stand-by for 2 entire weeks seeing as the birth of a calf can never be planned, naturally. This Michel Gondry-isch commercial for Ikea was nominated for the ADCN Young Director's Award. A Music video for Dutch band AWKWARD i. Just imagine yourself wandering down the shore and finding Silver Matthew. What a fun day lays ahead. Join crackhead Rinus and his friends on one of their many adventures in the city of Amsterdam. Life is hard for a junkie, but Rinus stays friendly nonetheless. Michiel ten Horn (1983) graduated in 2007 from the HKU, the University of the arts Utrecht, where he studied animation. As a student he already focussed on live-action, but his animation background stayed active, in his storytelling and use of form. After his successful debut movie De ontmaagding van Eva van End, with its world premiere at the Toronto International Film Festival, the prestigious American film magazine Variety listed Ten Horn as one of 'Ten European directors to watch'. His last movie Aanmodderfakker was nominated for Best Director and won three awards for Best Film, Best Scenario and Best Actor. Michiel is currently working on several new projects, among which two feature films and the first Dutch Netflix Original series.